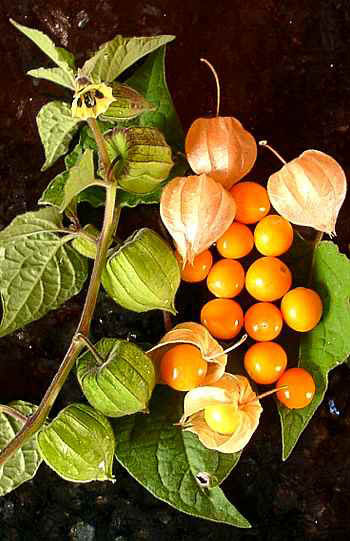 Aguaymanto Very large Physalis variety from south Peru. Very good taste, well suited in regions with cooler climate. Similar to hot peppers, the cultivation has to be started early in order to get sun-ripened crops before beginning of autumn. 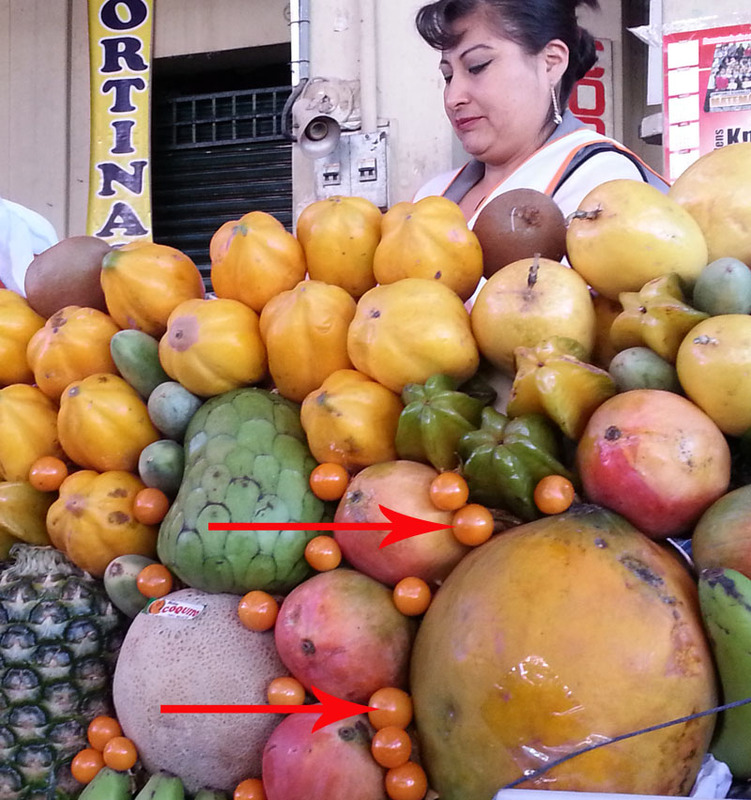 They only taste good when equally and fully ripened to yellow-orange and when their paper-like shell isn´t green anymore. Sowing should be done covering them at 24-25°C estimating germination after 3 weeks at latest. After germination the young seedlings have to be moved to a cooler place with much light, otherwise they etiolate. The following cultivation process is equal to the one growing hot pepper and tomato. 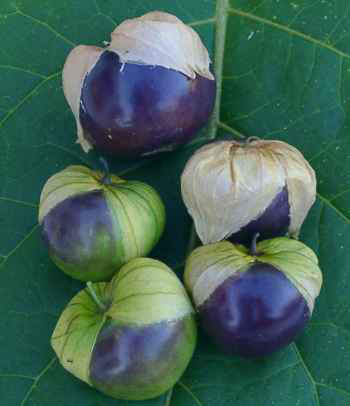 Physalis ixocarpa purple Physalis ixocarpa varieties are called Tomatillo en Mexico. Fruits are saved when not fully ripe. Der Geschmack erinnert etwas an einen vollreifen Rhabarber. 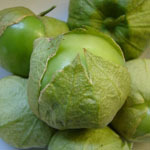 In der mexicanischen Küche werden sie hauptsächlich für Salsas verwendet, Chutneys werden damit auch hervorragend. Zwischen der Variation purple und verde besteht hauptsächlich ein farblicher Unterschied bei den Früchten, Geschmack und Aroma sind sehr ähnlich. 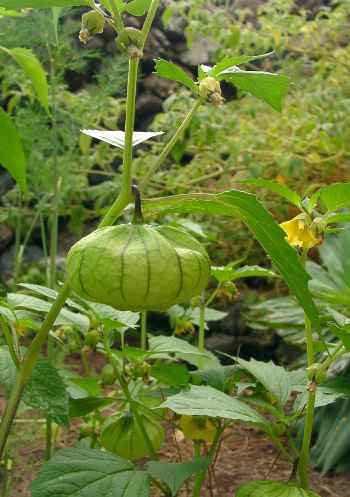 Physalis ixocarpa verde In Mexico the Physalis ixocarpa types are called Tomatillo. Their fruits should be gathered when still not fully ripened, then they´ll provide the perfect balance between sourness and sweetness. Their taste reminds of mature rhubarb. The Mexican kitchen mainly uses them for salsa. Chutneys also got an incredible touch when made of them. The main difference between the variation purple and verde is in the coloring of their fruits, while taste and flavour are very similar. 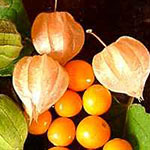 Physalis peruviana The Cape gooseberry has become quite popular during the past years. Similar to hot pepper, you have to start early in order to get sun-ripened fruits before autum starts. 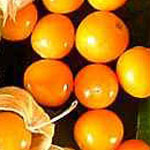 These berries only taste good when they have been matured all-over to a yellow-orange coloring which means that their papery shell isn´t green anymore. Sowing should be done covering them at 24-25°C calculating a germination time of up to 3 weeks. The young seedlings have to be put at some cooler place right after having germinated. They furthermore need a lot of light. Otherwise they may etiolate. The following cultivation is the same one considered for for hot peppers and tomatoes.